The new blueprint provides secure implementation automation for building solutions in environments supporting Health Insurance Portability and Accountability Act (HIPAA), a US healthcare law that establishes safeguards for individually identifiable health information; as well as the Health Information Trust Alliance (HITRUST) framework, a widely recognized security accreditation in the healthcare industry. The blueprint is intended to serve as a modular foundation for customers to adjust to their specific requirements and accelerate the development of machine learning experiments to solve both clinical and operational use case scenarios. A sample use case scenario: A machine learning experiment for predicting length of stay, a sample data set of 100,000 patient records formatted using Fast Healthcare Interoperability Resources (FHIR), and data visualization using Power BI. Deployment template & automation scripts: Azure Resource Manager templates and PowerShell automation scripts are used to automatically deploy the components of the architecture into Azure by specifying configuration parameters during setup, and pre-load the same data and use case scenario. Cybersecurity threat model & component architecture: A comprehensive threat model provided in tm7 format for use with the Microsoft Threat Modeling Tool, detailing the components of the solution, the data flows between them, and the trust boundaries. The threat model is designed to help customers better understand the points of potential risk in the component reference architecture. Customer responsibility matrix: An Microsoft Excel workbook listing the relevant HIPAA/HITRUST requirements and explaining Microsoft and customer areas of responsibility. External compliance review: A report produced by Coalfire Systems with an auditor's review of the solution, and considerations for transforming the blueprint into a production-ready deployment, covering both HIPAA and HITRUST. The blueprint provides all the building blocks to successfully start using a serverless cloud solution in under 25 minutes! For a quick look at how this solution works, watch this five-minute video explaining, and demonstrating blueprint deployment. “The blueprint has helped IRIS to justify we are going in the right direction, and that we are not doing anything rogue when it comes to security, privacy, and compliance"
- Jonathan Stevenson, Chief Information Officer of Intelligent Retinal Imaging Systems. To learn more, join Microsoft at HIMSS 2018 and discover how health organizations across the globe are partnering with Microsoft to move beyond digitization into transformation and rallying with innovation. 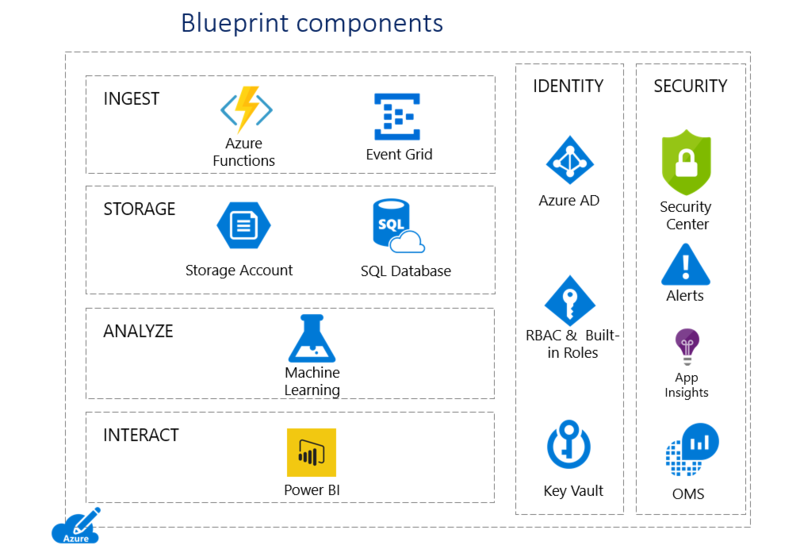 Learn more about Azure Blueprints on the Service Trust Portal. Learn more about Microsoft’s compliance with HIPAA and HITRUST on the Microsoft Trust Center.